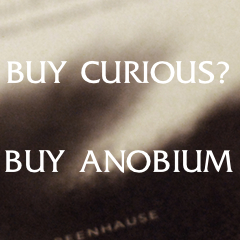 Anobium is an independent literary publisher promoting outsider media, creative exploration, and intellectual experimentation in and beyond the digital community. Anobium was founded in 2011 by “Mary J. Levine” and Benjamin van Loon. We value ingenuity, iconoclasm, and interdependence. No writer or artist is an island, but a node in a network that pulsates the present. If you have questions, please contact editor@anobiumlit.com.